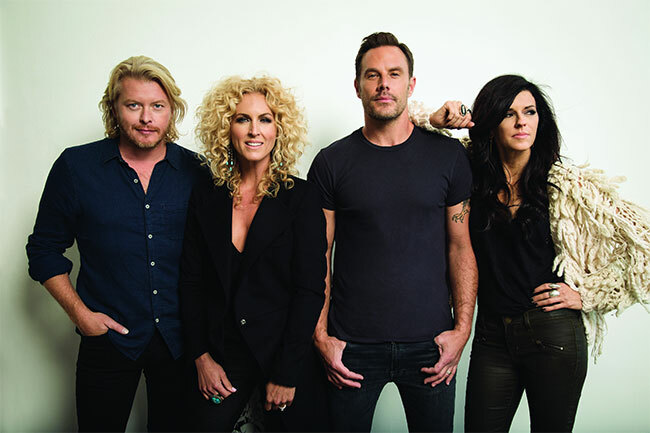 Multi-GRAMMY-winning artists and current GRAMMY nominees Karen Fairchild, Kimberly Schlapman, Phillip Sweet, and Jimi Westbrook of Little Big Town have been announced as hosts of the 2019 MusiCares Person of the Year tribute concert honoring Dolly Parton on Friday, February 8th. GRAMMY winner Yolanda Adams, current GRAMMY nominee Jon Batiste, past GRAMMY nominee Cam, current GRAMMY nominee Brandi Carlile, GRAMMY winner Jennifer Nettles, and current GRAMMY nominee Margo Price will join the performance lineup at the star-studded annual fundraiser for MusiCares, the signature health and human services charity founded by the Recording Academy. Previously announced performers include Leon Bridges, Garth Brooks & Trisha Yearwood, Miley Cyrus, Lauren Daigle, Vince Gill, Don Henley, Norah Jones, Shawn Mendes, Kacey Musgraves, Willie Nelson, Katy Perry, Linda Perry, P!NK, Mark Ronson, Mavis Staples, and Chris Stapleton. GRAMMY winner Dolly Parton will close the evening’s performances. Greg Phillinganes will be the musical director. Attendees will include Neil Portnow, President/CEO of MusiCares and the Recording Academy; Michael McDonald, Chair of MusiCares; Alexandra Patsavas, Chair Emeritus of MusiCares; and John Branca, Honorary Chair of MusiCares. Dolly Parton is being recognized as the 2019 MusiCares Person of the Year in recognition of her significant creative accomplishments and longtime support of many charitable causes. Proceeds from the annual Person of the Year tribute — now in its 29th year — provide essential support for MusiCares, a charity founded by the Recording Academy that ensures music people have a place to turn in times of financial, medical, and personal need. The MusiCares Person of the Year tribute is one of the most prestigious events held during GRAMMY Week. The Person of the Year gala will begin with a reception and silent auction offering an exclusive and unparalleled selection of luxury items, VIP experiences, and one-of-a-kind celebrity memorabilia for bidding guests. The reception, along with a silent auction sponsored by Delta Airlines—the official airline of Person of the Year, will be followed by a gala dinner sponsored by AEG; a live auction; a tribute concert featuring renowned musicians and other artists; and the award presentation. GRAMMY Week culminates with the 61st Annual GRAMMY Awards at Staples Center in Los Angeles on Sunday, February 10th. The telecast will be broadcast live on the CBS Television Network at 8 pm ET/5 pm PT. Over the course of the last fiscal year, MusiCares provided more than $6.5 million dollars to approximately 8,600 members of the music industry — the largest number of clients served and dollars distributed in a single year in the charity’s history. Established in 1989 by the Recording Academy, MusiCares offers health and human services and programs to members of the music community, including emergency financial assistance for basic living expenses such as rent, utilities, and car payments; medical expenses, including doctor, dentist and hospital bills; and treatment for HIV/AIDS, Parkinson’s disease, Alzheimer’s disease, hepatitis C, and other critical illnesses. MusiCares offers nationwide educational workshops covering a variety of subjects, including financial, legal, medical, and substance abuse issues, and programs in collaboration with health care professionals that provide services such as flu shots, hearing tests, and medical/dental screenings. MusiCares provides access to addiction recovery treatment and sober living resources for members of the music community. Staffed by qualified chemical dependency and intervention specialists, MusiCares offers Safe Harbor Room support, sponsored in part by the Bohemian Foundation, to provide a network to those in recovery while they are participating in the production of televised music shows and other major music events. MusiCares holds weekly addiction support groups for people to discuss how to best cope with the issues surrounding the recovery process. Past MusiCares Person of the Year honorees include: Tony Bennett, Bono, Natalie Cole, Phil Collins, David Crosby, Neil Diamond, Bob Dylan, Gloria Estefan, Fleetwood Mac, Aretha Franklin, Don Henley, Billy Joel, Elton John, Quincy Jones, Carole King, Paul McCartney, Luciano Pavarotti, Tom Petty, Bonnie Raitt, Lionel Richie, Paul Simon, Bruce Springsteen, Sting, Barbra Streisand, James Taylor, Brian Wilson, Stevie Wonder, and Neil Young.